We had a Kenya shower for her before she left. We prayed for her and gave her a scrapbook to fill with pictures, a journal with Scriptures written in it to give her strength on the journey, and practical stuff like personal hygiene wipes, toilet seat covers, and bug spray wipes. This is a picture of our get-together. Angie is on my right (or left, I'm never sure how that works) in the pink sweatshirt. 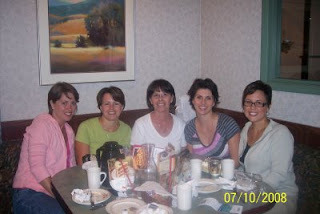 It is Angie, me, my mom Jan, Lisa, and Charity. The girls. I find its almost more fun to watch God work in someone else's life than in my own. Thanks for sharing the story. This is very exciting--you definately have a vested interest in this trip!! It is so exciting to be used by God and then to see where He goes with it after that!